FLArmenians invite you to come and show your support and contribute to the Florida Syrian Armenian Relief Fund. There are over 100,000 Armenians affected by the deteriorating security situation in Syria, particularly in Aleppo. Our Armenian brothers and sisters have been forced to leave their homes, businesses, schools, and are unable to access basic supplies such as food, clean water and medicine. 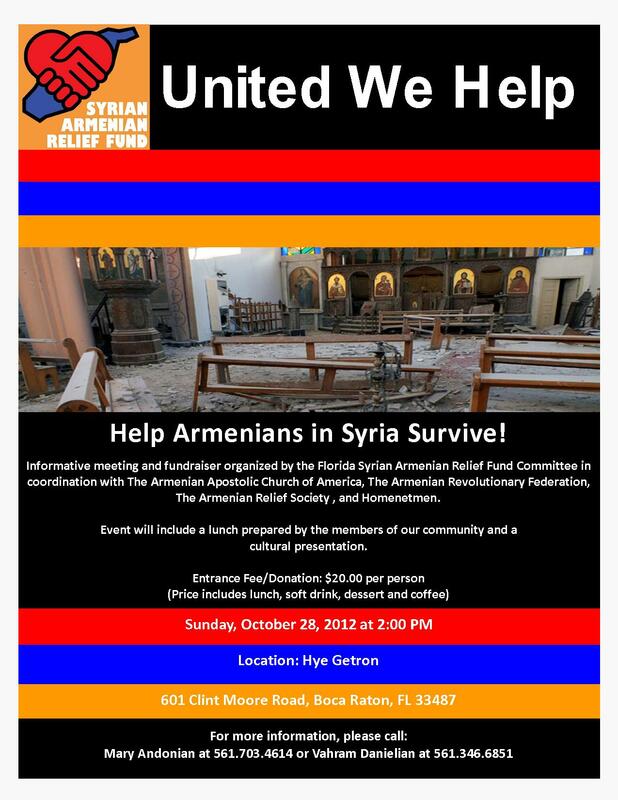 The Florida Syrian Armenian Relief Fund Committee, in coordination with the Armenian Apostolic Church of America, A.R.F., A.R.S., Homenetmen, and FLArmenians has organized an informative meeting and fundraiser on Sunday, October 28th at 2:00 PM. Please help us send as much assistance to the Armenian-Syrian community as possible. This event is open to the public with a requested donation of $20 per person. A nice lunch, soft drink, dessert and coffee will be served to participants. In this time of crisis, we hope you can take the time to learn about the dire situation Armenians face in the battle for Syria, and do something to help our Christian brothers and sisters. WHY: Help Armenians in Syria Survive! For more information please call Mary Andonian at (561) 703-4614 or Vahram Danielian at (561) 346-6851.